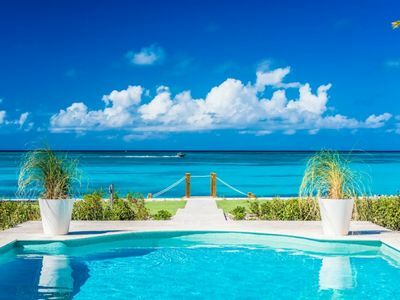 Welcome to a place where you can truly leave your troubles behind. There is no shortage of beaches to choose from. 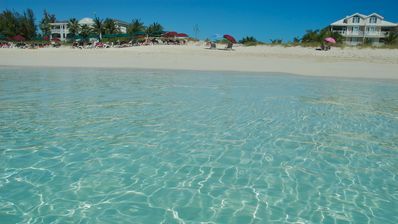 Grace Bay, Pelican, Emerald or Long Bay beach are minutes away from the villa and safe for jogging, walking, cycling. 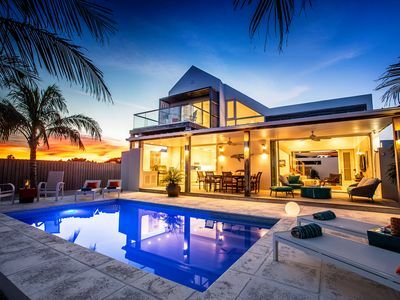 Villa Tropica is a vacationer's Paradise, nestled in the upscale villa community of Leeward which borders Grace Bay shopping and restaurant district, and surrounded by 4 great beaches, a Casino and a Golf course. 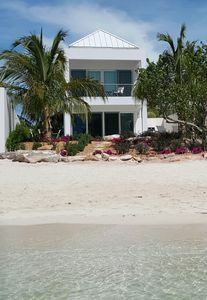 The Villa will boast 4500 sq-ft of living space surrounded by half an acre of tropical landscaping. 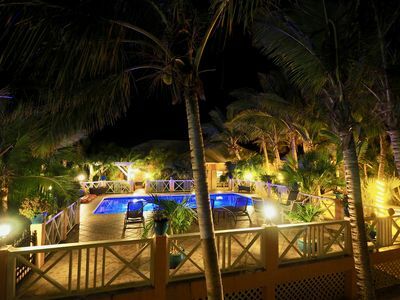 The lush tropical garden and the pergola provides cooling shade after a day playing at the beach. 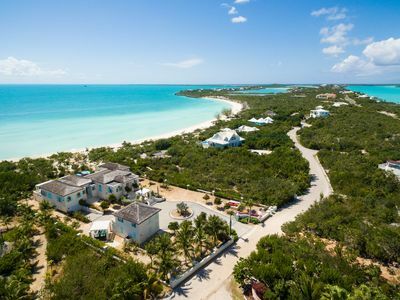 This luxury villa features five spacious, well-appointed bedroom suites, a gourmet kitchen, large living and formal dining room, secondary living room, game room, laundry room, 30 feet chromatic private pool, and lots of outdoor dining and lounging space in a lush garden. Relax yourself in the hammock surrounded by Palms ! 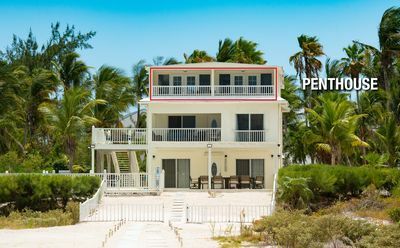 Beautiful powdery white sand and gin-clear waters of Pelican Beach, a mere 2 minutes walk away from the villa and spans over 3.5 mi into Grace Bay Beach which is another 12.5 mi stretch. Anyone for beach walking? The calm waters provide crystal clear visibility and only a foot or two deep out to about 15 feet from shore, great for small kids as well as areas for diving. 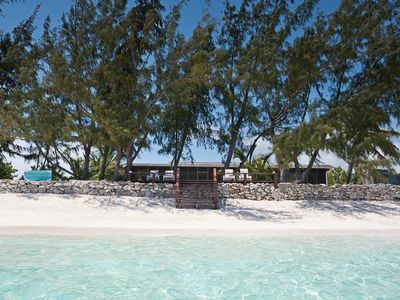 Pelican Beach is known as 'the best-kept secret' as its unspoiled nature lends to photographers seeking to capture the heart of the islands. 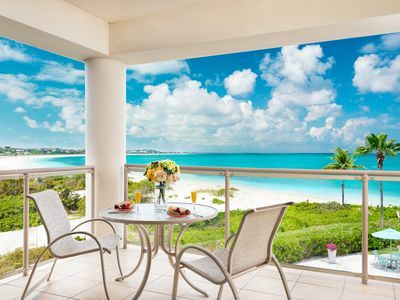 Grace Bay area is 2 miles away where you can find a large and quality supermarket, stores and restaurants. There is also a convenience store within a mile from the villa at Bleu Haven. Meals can be ordered and picked up for breakfast, lunch and dinner from Fresh Bakery at the Atrium (0.3 mi). As an option, you can have a Chef to cook your dinner with our best local meal. 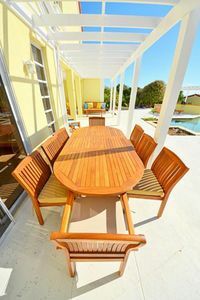 There is also a Pergola for alfresco dining with an outdoor gas BBQ grill and dining table in the gardens. In the living room are plush sofas sufficient for 10 persons to sit comfortably while watching television on the 65 “ big flat-screen TV with cable service and DVD's. There is also a portable iPod docking station and radio. The secondary living room comes with a LCD TV and a Roku device featuring Netflix, sports channels, movies, games and lot more. Guests of all ages will have fun exercising their skill with the Baby Foot table. Use the complimentary bicycles to explore the neighborhood. Kids will enjoy the pool and the pool toys. Use provided beach chairs and umbrellas to fully enjoy your day at the beach. Island is safe for jogging, walking, cycling. 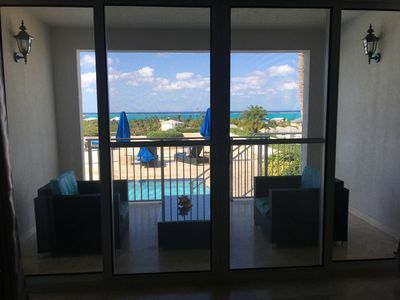 The master bedroom features ensuite bath, jacuzzi tub and shower, walk-in closets, King Bed, air conditioning with a relaxing view on the palm gardens. 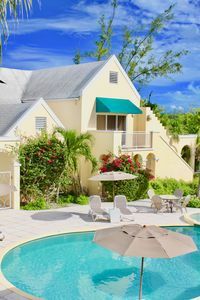 Green Bedroom has an ensuite bath with shower, Queen Bed, air conditioning, ceiling fan, door leading out to the pool area. Turquoise Bedroom and Bleu Bedroom share a jack and Jill Bathroom with shower. 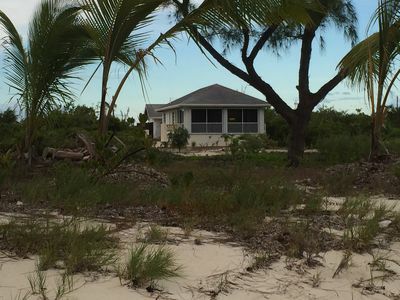 Both have Queen Bed, air conditioning, ceiling fan and garden views. All bedrooms are equipped with Plush Egyptian cotton linens. The suite is open for large group or when a fifth bedroom is required. The suite features an ensuite bath with shower, King Bed, private living room with a sofa bed, LCD television, air conditioning and two ceiling fans. 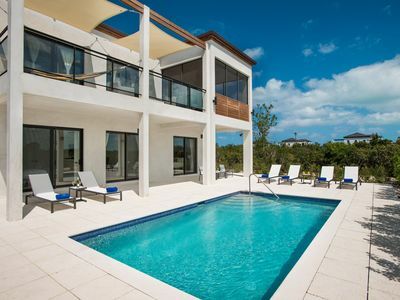 The villa is located in the upscale, safe neighborhood and security patrolled of Leeward. In addition, guests can feel more secure in using the state-of-the-art alarm system and the room safe. Guests are welcome to use the unlimited Wi-Fi indoor and outdoor with our outside Wi-Fi amplifier. A local pre-paid mobile phone is also provided. 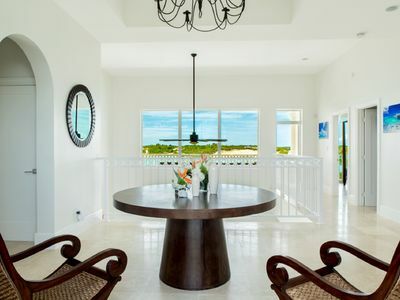 Our property manager Robert from SeaShell Breeze Group will do a brief orientation of the Villa upon arrival. He will be available to you throughout your stay to answer questions, make recommendations on dining and activities, and address any problems that may arise. We want our guests to have a truly fantastic vacation, and we are here to assist you with both your vacation planning and on-island needs ! 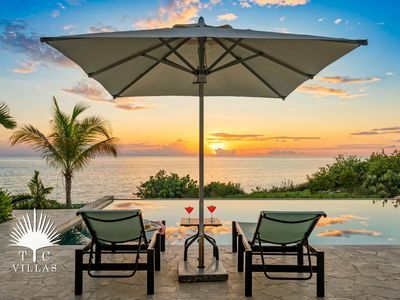 Just a short flight from the east coast of the US, our islands are a tropical classic, a throwback in time where relaxation is unavoidable and rejuvenation ensured. 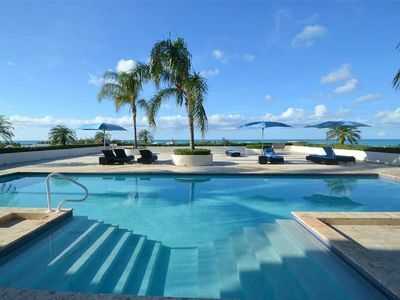 Newly priced: One-Bedroom Suite With Breath-Taking Panoramic Ocean Views! 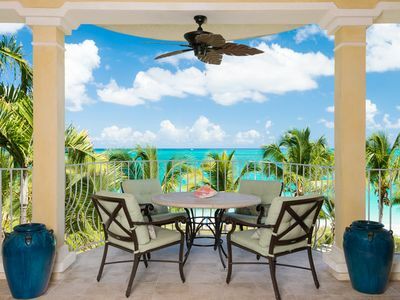 Royal West Indies Resort , suite 123, Spectacular Beachfront Condo on #1 Beach.